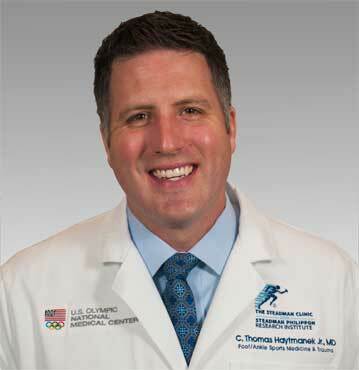 Vail, Colo.-based The Steadman Clinic welcomed C. Thomas Haytmanek Jr., MD. A foot and ankle specialist, Dr. Haytmanek focuses on fracture fixation, ankle arthroscopy, cartilage restoration and foot and ankle sports injuries. Dr. Haytmanek’s research is on hindfoot fusion nails, total ankle arthroplasty and cartilage repair. He joins the clinic from Coughlin Clinic at St. Alphonsus Regional Medical Center in Boise, Idaho. The Journal of Bone and Joint Surgery, Clinical Orthopaedics and Related Research, Foot and Ankle International, American Journal of Sports Medicine and Knee Surgery, Sports Traumatology, Arthroscopy have published his work. He is on the U.S. Ski and Snowboard medical team. Dr. Haytmanek completed his orthopedic surgery residency at Durham, N.C.-based Duke University. During his tenure, he served as a Parekh Traveling Scholar, traveling to New Delhi, India. He was a fellow at The Steadman Clinic from 2013 to 2014.